Not many CEOs would have entertained my cheeky request to have whisky, but IWC‘s CEO Christoph Grainger-Herr is unlike most CEOs. The head honcho laughed when I pointed at the decanter on the table, filled with the golden liquid, and poured two measures, one for me and another for himself. It’s a reflection of his leadership style – quick on his feet, constantly listening, and always accommodating. We shot the breeze with Grainger-Herr when he was in town and asked him for his candid thoughts about the brand and the industry in general. How do you think the watch industry has evolved since you joined in 2004 until now? Back in the day, we had little expertise on many different levels. It was a random workshop mentality of “Oh we have parts, and cases, let’s make something”. Every watchmaker worked on their own. They made excellent watches but there wasn’t a lot of communication nor professional organisation in the teams. When I look at all the development of skills that came into the business in this time, it’s been absolutely astonishing. I think marketing alone grew from about 15 people to 85 now, and you have digital specialists, performance marketing specialists, CRM specialists, retail specialists, etc. All of this did not exist 10 years ago. In the industry we always have the creativity and passion for the products but the way the business has been professionalised is astonishing. 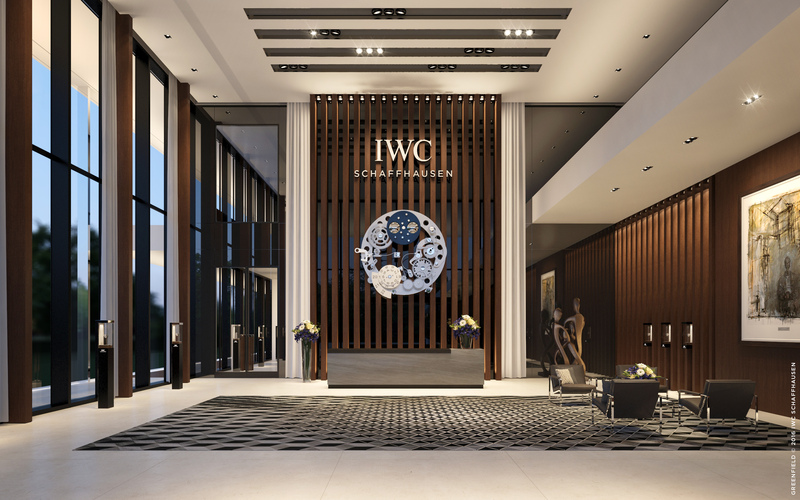 How do you marry modernity with IWC’s long heritage? Well, I always go back to our founding father, Florentine Ariosto Jones. He was not only a watchmaker and an engineer, but an industrial entrepreneur from America. He came to Switzerland with that mission of combining traditional Swiss craftsmanship with the American industrial approach, and it’s been the same ever since. If our watchmakers and engineers find a way to create something that makes our watches even better, then we will use it. We are not afraid of technology. This contrasting idea of modernity and heritage has never been a contradiction for IWC. We have always been comfortable with it. After all, that’s how we started. Tell me about the new manufacture. Previously, we were quite scattered but now, with a big enough site, we can achieve two things. One, we can create a logical and efficient production flow and two, we can design the perfect visitor experience. We have a team working on the visitor’s journey and another on a layout for maximum efficiency. We ended up with a 13,000 square feet building that only has two production floors. I find it very interesting that the new manufacturing is also laid out with visitors in mind. Why is this important? I think we have that uniqueness of being able to show everything we do in one place, which not many industries can do, and when you’re working on products that nobody needs but a lot of people want, it’s all about emotion. There are two sides to emotion: the first is the pure falling-in-love feeling you get with the product when it’s on the counter. The second is when your heart and mind tries to justify the purchase. I think a manufacturing tour is the most powerful tool in trying to show people the number of hours and craftsmen required to complete one watch. It demonstrates the value of the watch. As a CEO you’re not only trying to solve current problems but also anticipate future problems, trends and opportunities. What do you think are the problems and opportunities of tomorrow? I think the key challenge is communication. We have never been able to have the chance to communicate and connect directly with our clients like we do now. But when you look at it from the other end of the spectrum, our job has always been to create trends, to come up with things that people did not anticipate that they would want or need. The question is: how do you balance consumer insight and demand with the act of creation? That is a new challenge. In the past, we created things and hoped that people would like it but now we have so much data to sieve through just to understand what people are likely to fancy. Having said that, you must also not completely change a brand according to the whims of your customers because you will lose your identity. I feel like the watch company CEOs of today have a certain rockstar appeal and I feel that it’s a response to today’s business environment of associating a brand with a person. Would you ever potentially go down that route? Without getting too religious, this idea of having someone to transport the values of the brand, like a rockstar CEO, is similar to having brand ambassadors. On the other hand, I fundamentally believe that the brands we are looking after are infinitely more powerful than any person who has ever been in charge of them. We can select the people that perfectly fit our brand but the brand is always bigger than any of us. I’m not sure if being a rockstar is the correct answer to the challenge, but having people who live and breathe the brand so that others can fall in love with it is very important. Who is the current IWC man for you? Men who are 25 to 45, entrepreneurs, or those in the classic industries of finance and law, and those who are inspired by engineering, style and adventure. That’s the IWC man for me.